Combat got a whole bunch of attention these last few weeks. First off, I'd been working on this overly complex system for weapon arcs where they changed shape and size over time independent of the animations themselves. After getting nowhere fast with this and with an imminent team review, I decided to pare things down and go with collision boxes based on animation frames. It's a decision that instantly got good results, made some reuse of existing systems, and massively simplified the headaches I'd been having. In retrospect, I can't believe I hadn't gone with it sooner and it definitely goes to show the use of a deadline for rethinking solutions which may be 'realistic' but don't justify the time and effort! The team review was also really handy for putting things in perspective and being able to compare notes and see the system in use. It's something which I think is a trap development often falls into on a team, where it feels like there's such an overload of work there's never time to react or review it in-progress. Since time was made for it though, I've now pushed along bits that would have taken me a while to spot or get to and it makes for a more collaborative team effort. The best time for review (and feedback) seems nearly always to be as soon as possible because that gives the most chance to course correct and leads to the least work being redone. We also had a review this morning which had a much smaller quantity of feedback to give, hopefully showing that the majority of the initial flow of it is in shape. Still to come will be the fine tuning and variations on a theme when we can add more variety to the combat based on creature type. It's another feature that'll need to jostle position for attention from now on. Hopefully there's not too many more of those and that they get the benefits of experience as the code matures and hands more responsibility off to data. Another week rolls by...another Post update I forgot to write. Time at the moment just blurs along and it sometimes feels like crawling through honey. It is a sweet experience, but very slow and messy. As new indie devs, we find that we live by the three 'ations'...organisation, communication, and motivation. These sometimes fall apart as we have so many plates to spin and people tire or personal lives get on top of them. There may be money worries, or just a bit of illness pop up, or bad internet, or just not feeling creative. Problems come and go, but throughout it all we have learned some powerful lessons. The first is that we have great team camaraderie and spirit - when one flags, the others prop them up. The second is that we have amazing support from our backers and community. Every nice comment, every piece of art, every bit of excitement and encouragement...each fires us forward. It is surreal to experience it all firsthand. At Lionhead, the excitement was more diluted among the entire team and more towards the big names. At PixelCount, we are the ones responsible so we feel more of that community sunlight (when not experimenting in our castle cellars). Of course we also feel the negative side of things, but we try take it on the chin and if we can't convert them we at least respect their thoughts and move on. As for what I did this past week, more books! Better written older books! Prettying and collisions! Now what day/year is it? Last week I had to find out what it sounds like when you deflect something made of glass with a sword. I also did some experimenting with combining actual recordings of sounds with the more abstract 8-bit depictions of those sounds we know from the 8-bit era of gaming. They sometimes combine surprisingly well! I think Kynseed is in a remarkable grey area between an 8-bit experience and a more audio/visually rich one and I'm trying to walk that fine line between them. Meanwhile, now that I have rough versions of all the music tracks we'll be adding to the Early Access release (lest more are added), the prettying of these tracks has begun. This is a time of a million small adjustments. A wee bit more volume here, a smoother note transition there - really small things. But a lot of them. And you need to listen with a much more critical ear to find them. When I first start to compose something, I don't want to be critical, because nothing would get done. But as I do more polishing on it, I have to become increasingly critical. And sometimes I feel I'm not pushing it far enough. Then feedback from someone like Matt becomes increasingly valuable. I can rely on him to hold nothing back, and that's priceless for any artistic endeavor. Of course that doesn't mean you should be scornful of things you dislike, but that's not what I mean. Just to not leave anything unmentioned (kindly), so that we can make the best game possible. By the time this 'nitpicking' stage begins, the track has already been approved and I know I generally made the right track. So the basis isn't 'if you don't fix this little thing, the track is bad', but rather 'if you fix this little thing, it'll be even better than it was'. And that's a motivating experience. I do reckon I need to become better at doing my own nitpicking though. For a game that heavily features travelling through the countryside, we indie devs seldom seem to leave our desks. So this last weekend, I set out to remedy that. Don't get me wrong, I keep pretty active by default. I live in a very walkable city, so I end up doing almost everything by foot. Tack on a few gym visits a week and I like to think I'm not too sedentary for someone who occasionally spends 16 hour days behind a computer. But being active and being in nature aren't the same thing. So let's rewind to last week. I was barely keeping my head above water with everything that needed doing and new tasks were piling up. There were announcements to prep, a new trailer, screenshots, production spreadsheets, numerous team calls, and so on. Something I often struggle with is an incurable obsession with chasing perfection in my work, but combine that with having very little time to complete said work and concessions will invariably have to be made. I die a little inside every time I have to cut a corner. I'm being dramatic of course, but things like that are an ever-present reminder of how workload and deadlines create a constant internal war in game dev. But to mirror some of Neal's observations in his above update, sometimes the easiest way to solve this problem is to shift perspective and find a new approach. That's why people tend to have their best ideas in the shower. It's because during such moments, the mind goes into what scientists refer to as an incubation period. Disengaging from distractions allows the mind to wander, and when that happens your subconscious problem solving abilities can surface and plant ideas into your conscious mind. But this last week, I was finding it hard for my mind to disengage at all - as if I'd gotten permanently stuck in fifth gear. This was all due to mounting workload and approaching deadlines (some of which are huge). To me, deadlines often feel a bit like the horror movie It Follows (which has a stellar soundtrack by Disasterpeace, by the way). It doesn't matter where you are or whether you're ready - deadlines will eventually catch up with you. This last week I'd also been uncharacteristically silent on our Discord as a way to help ensure focus and reduce distractions. But ultimately, I decided that what I really needed was to get out of the city for the weekend. So I grabbed a backpack and did just that. I drove north out of downtown Los Angeles to a trailhead at the base of the Santa Monica Mountains, which is nestled just west of the (much colder) San Gabriel Mountains. My objective was to hike 12.5 miles (20 km) while climbing 1,600 feet (500 m) to the highest mountain summit. 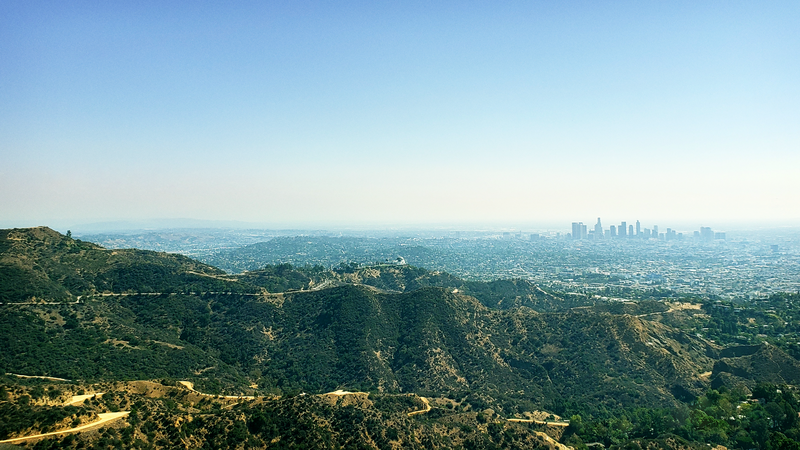 If you've ever played GTA 5, the areas I hiked are what that game's mountain trails are based on. Except, you know...life size. The neat thing about this hike was that on the right side of the mountain was beautiful natural forest and on the left side was sprawling cityscape - both as far as the eye could see. I've always found both types of landscapes beautiful, so I really enjoyed this dichotomy. Untamed wild nature on one side, the peak of human civilization on the other. After a grueling hike, I reached the summit. It was an unusually clear day without a cloud in sight and visibility was a little over 10 miles. Exhausted, I sat down on a small rock and took it all in. Behind me was the Angeles National Forest stretching off into the skyline. In front of me was the entirety of Los Angeles county with downtown looking very distant and small. To the right of that I could just make out the Pacific Ocean shimmering in the sunlight. I returned from this excursion exhausted but satisfied. I have blisters on my feet, sunburns despite my best attempts, and more sore muscles than I care to count. I'm now back behind my computer once again, here in the heart of downtown. My windows are open, there's a light fall breeze, and the distant baritone hum of the city is interrupted only by the staccato sound of me tapping away at my keyboard as I write this update. Yet no sooner had I written the above paragraph was there a knock on my door. I opened it to find a stranger on the other side who said, "Matt?" I replied with a slow "...yes." They said, "Sorry for the wait." I told them it was no problem (which was true, as I didn't even know I'd been kept waiting.) Then they handed me a cup and walked off. It was a cup of nitro cold brew coffee, something that I've developed a bit of a reputation for liking over in our Discord. How curious. I sipped on this drink, confident (perhaps naively so) that nothing nefarious had been done to it, and figured I'd look into who the mysterious coffee faery was just as soon as I finished proofreading my unnecessarily wordy Post update. But before managing to finish, there was another knock on the door with another stranger asking if I was Matt. I was still Matt and, as a result, I was handed something yet again. This time it was a small paper bag. I opened it to find a Philly cheesesteak from a nearby restaurant, still piping hot. At this point my curiosity became too much to continue working, so I took a break from my proofreading and did a bit of sleuthing. What I discovered was that a few members of the Kynseed community had decided to send me treats by coordinating with a certain sneaky composer who knew my address. Perhaps due to me having been unusually absent this last week, they had taken me for dead and this was their method to see if a corpse had taken up residence in my home. Thankfully, it had not. So as I sit here sipping on my coffee and munching on a sandwich, I can't help but echo some of the things Charlie mentioned up above. Indie development is stressful, expensive, high risk, and it does a real number to one's health and social life. But each time those things get difficult to manage, there's always a community of people excited to see where this journey of ours goes. I know we mention it in almost every update, but that sorta thing does so much to propel us forward each day - more than you know. I sometimes worry that all we do in our Post updates is wax poetic about game development and that we never really give direct progress reports on things. (Bless Neal and Matthijs for actually doing so this issue.) But if we're to place games on the same podium as other art forms, then it stands to reason that the act of creating games cannot be divorced from the psychological element necessary for creating art. Those sorts of things are just as important to the development of a game as the code itself. Currently the team is reaching new levels of excited anticipation and, as I'm fond of saying, things are very much afoot. Thankfully, my weekend excursion (along with the community's support and generosity) has had a very motivating effect. So as bonkers as the next few weeks are going to be, I'm looking forward to seeing it all through. P.S. Just as I finished with this update, there was a third knock on my door, this time with a couple of Red Bulls. I love you goobers. Really appreciate all the effort you guys are putting in! Keep up the good work! Already time for another issue! Head on over to Issue #40 to read about the latest going ons. All times are GMT +1. The time now is 06:51am.